Pearly white teeth are a sign of good dental hygiene and they look great in photos. Keeping your teeth white can be a challenge because many foods we eat can cause surface stains and cavities. Brushing your teeth regularly, flossing and using teeth whitening products can help brighten your smile. There are also teeth whitening gels, pastes and mouthwashes, though a bleaching treatment from your dentist's office is the most effective remedy. Follow the instructions below for teeth whitening treatments you can do at home. Dip your toothbrush in a small amount of peroxide and then dip it into baking soda. Brush your teeth for at least two minutes and rinse your mouth well. Brush your teeth using your regular toothpaste for at least 30 seconds afterward. While this method is effective in helping most people achieve a whiter smile, you should use it only once or twice a week to prevent tooth sensitivity. Eat plenty of strawberries, which contain malic acid, a natural bleaching agent that may be as effective as name-brand teeth-whiteners. 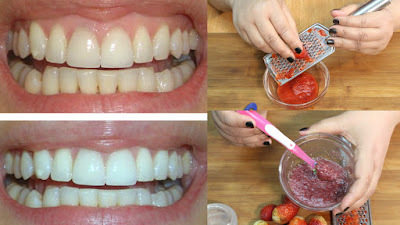 Mash a strawberry and apply it directly to your teeth to brighten your smile gently and effectively. Rub the inside of a banana peel on your teeth every day for at least two minutes before brushing. Swish a whitening mouthwash in your mouth for at least 60 seconds twice daily.